The smart door lock app joins a growing roster of connected home controls for Apple’s wearable. What can your Apple Watch do without your iPhone? An Apple Watch can already control your connected light bulbs and thermostat, and now it can let you through the front door as well. Smart door lock maker August has just added Apple Watch support to its iOS app. 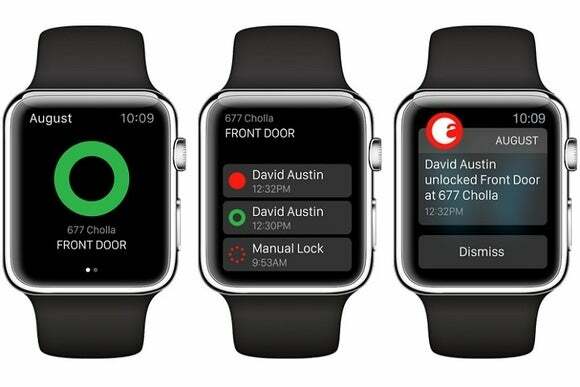 Users can view door unlock status through the Watch’s Glances menu, and receive notifications when someone opens the door. The app also lets users lock or unlock the door, and view a log of recent activity. August’s $250 lock replaces an existing deadbolt and connects to smartphones via Bluetooth, while an optional $50 Wi-Fi hub lets users control the lock remotely over the Internet. The lock is powered by AA batteries, and includes a standard keyhole as a fallback. The Apple Watch doesn’t connect directly to the lock; like all other current Watch apps, it requires a Bluetooth connection to an iPhone, which in turn makes its own Bluetooth connection to the lock. Perhaps this will change in future versions of WatchOS, as Apple starts allowing native apps on the platform. The Apple Watch app could be a pleasant addition for August users, though it isn’t totally necessary; August’s already includes an auto-unlock feature that automatically opens the door when a trusted iPhone is in close proximity, so it’s possible to gain entry without even lifting a finger. Why this matters: August’s app appears to be the first smart lock application for the Apple Watch, though it joins a growing roster of apps for controlling connected home products from the wrist. Smart home controls could become the Apple Watch’s killer app, especially with the arrival of voice commands for HomeKit accessories in WatchOS 2.